Flickr/Defence Images. Some rights reserved. Trident serves a second political objective in the sense that it underscores the ruling government’s economic credentials. The aforementioned Conservative Party election manifesto noted that, in addition to its claimed contribution to deterrence, keeping Trident had the added bonus of ‘securing thousands of highly-skilled engineering jobs in the UK’. Labour ministers, too, highlighted the economic rationale for Trident while in government. It is beyond depressing that an issue as serious as whether this country should have nuclear weapons comes down, at least in part, to a few thousand jobs. A third political goal met by Trident is that it allows the government to cling to the illusion of great power status. As is the case with France, that other former colonial power, Britain is desperately holding on to its anachronistic position as one of the five permanent members of the UN Security Council. This is an anomaly that, by any objective measure, ought to be rectified. India, for instance, has a population of a billion people, but does not occupy one of these permanent seats. Our nuclear capability sets the UK apart from the vast majority of nations, however, and provides a tenuous justification for our presence at the top table of world affairs. That Trident is more about politics than defence can be seen from the shifting nature of the threat that the government invokes to justify its existence. Unlikely as it may seem, in 2013 North Korea, which was at the time acting in a particularly bellicose manner towards its southern neighbour, was employed as a stop-gap reason for our nuclear ‘deterrent’. Writing in The Daily Telegraph, the prime minister noted that the regime of Kim Jong-un was ‘highly unpredictable and aggressive’, had conducted nuclear tests, and had ‘unveiled a long-range ballistic missile which it claims can reach the whole of the United States’. His conclusion was that ‘it would be foolish to leave Britain defenceless’ in the face of such a threat. The danger posed by North Korea didn’t stand up to a great deal of scrutiny, of course. Unlike South Korea and the US, which have been in an armed standoff with North Korea for over sixty years, interaction between the UK and North Korea is almost non-existent. The chain of circumstances that would result in Kim Jong-un attacking Britain is hard to imagine, to say the least. Over the past couple of years, however, Russia’s actions in Ukraine have provided the government with a more believable threat, so the ludicrous North Korean menace has been quietly shelved. The fact that Trident is based on political and not defence considerations means that opposing arguments can be ignored regardless of their validity. Apparently, this extends even to the views of the military. 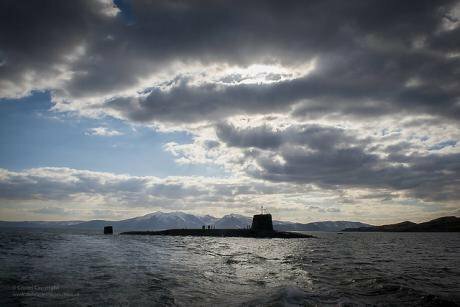 As former BBC defence correspondent Christopher Lee observed in a letter to The Times in September, ‘the case for Trident’s renewal does not have universal military support’. It would be surprising if many of this country’s citizens were aware of this significant fact, for the government short-circuits debate on our nuclear capability by depicting critics such as Jeremy Corbyn as a danger to national security. Even worse, Britain’s leaders appear blind to the impact that their rigid acceptance of the need for nuclear arms might have around the world. To return to the cynical decision to use North Korea as a bogeyman, why should Japan and South Korea, which have genuine defensive concerns in this regard, not follow the UK’s lead and develop their own nuclear arsenal as an ‘ultimate guarantee’ of security? To conclude, the unexpected rise of Jeremy Corbyn brings a welcome anti-nuclear voice to the forefront of British politics. As this article has shown, however, the overall consensus within Britain’s main parties is to retain the Trident ‘deterrent’, for political rather than military reasons. Unfortunately, it is difficult to see this changing, with the result that other nations have an increased incentive to pursue a nuclear weapons system of their own. Please donate to openDemocracyUK here to help keep us producing independent journalism. Thank you.